Night-Vision Dual-Camera thermal & ultra-low-light system. Ideal for Sport-Fisherman, Expedition Yachts, Mega Yachts, Sport Yachts, Center Consoles, as well as Commercial, Law Enforcement, Fire Boats and Military Vessels. 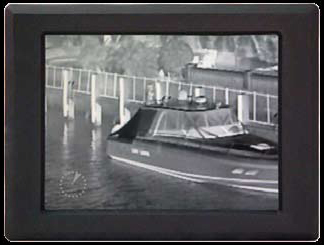 OceanView Technologies Thermal Camera Systems offer the boater piece of mind to boat safely and enjoyably at night. The Apollo II HD camera delivers more than four times the resolution than that of other cameras. Sharp detail and double the range at a reasonable cost. Combine the High-Definition thermal imager with the laser sharp low-light imager and you have the industry leading, state-of-theart, Apollo II HD. 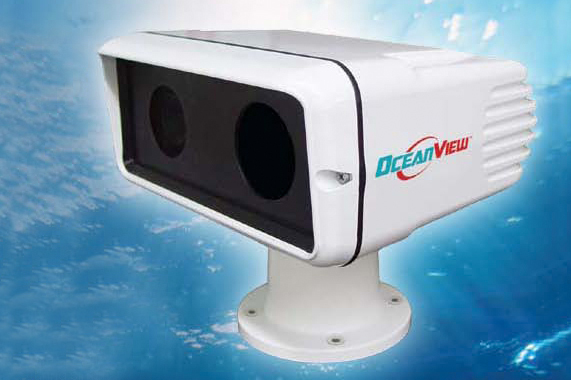 OceanView is considered as the time tested leader in Marine night-vision cameras. Navigation, surveillance and safety. OceanView cameras provide clear images in any light or environmental conditions. They offer a full line of thermal imaging options as well as low-light cameras and high quality color cameras. Their systems offer seamless integration with any marine monitor or TV and integrate easily with all marine electronics available today. They offer a solution appropriate to fit every need. Dual camera configuration - featuring simultaneously viewable independent Infra-Red Thermal & Ultra-Low-Light Imaging Sensors. High Definition 640 x 480 Thermal Imager - the Highest Definition available. The Thermal Imager allows for safe operation in total darkness. The Low-Light .00015 Lux, camera amplifies even barely discernable light to render a crisp detailed picture in adverse navigational conditions. Pan, Tilt and 4x Digital Zoom. Thermal image has a choice of 5 finger tip controlled color pallets. Return to "Home" position control on the Control-Unit Camera Direction Indicator. Low profile, classic, ergonomic design . Sealed & heated camera enclosure to withstand the harshest of environments. Saltwater & corrosion resistant construction with rugged triple-primed marine grade aluminum housing. Optional Interface for IP Control and Viewing Video. The Apollo II is simple to use and requires no training. 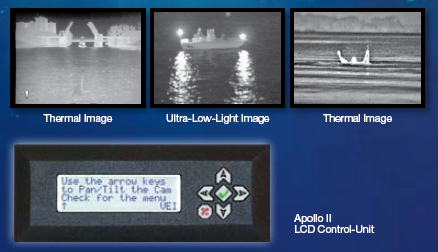 The Apollo II Control-Unit is the most sophisticated on the market today and it is simple to operate. It utilizes menu pages for ease of control of the operational features of the Apollo II Dual Camera System. It controls the Zoom, Pan and Tilt, color palettes and control-unit brightness. The unique Auto-Bright function in the menu adjusts the view on the display to the perfect brightness in any light condition. The initial display screen on the Control-Unit itself allows simple aiming of the camera using the four arrow buttons, with subsequent menu pages offering a range of other control options. The Camera Direction Indicator is clearly visible in the lower left corner of the Control-Unit.